Theresa May refused eight times yesterday to rule out scrapping vital workers’ rights after Brexit . 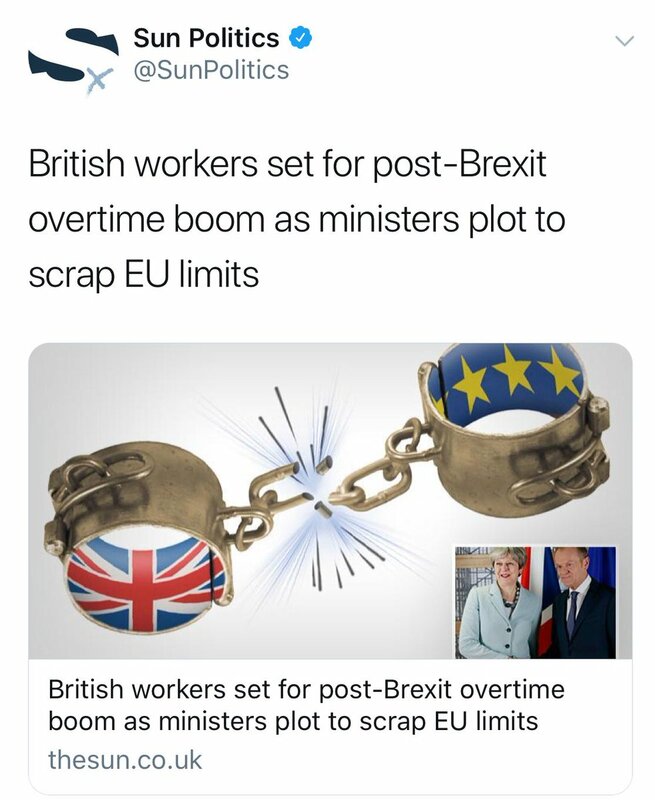 The 48-hour week and paid holidays are under threat in a plot by Brexit-backing Tories to axe the EU’s Working Time Directive. Over the weekend reports suggested Brexiteers in the cabinet will demand the scrapping of the vital protections in order to agree a phase one deal. Labour’s Wes Streeting said: “Today has underlined how weak Theresa May really is. She is at the mercy of the Brextremists in her own party. An economists’ study says Brexit is already costing Britain £350 million a week in lack of growth, investment and output. Remainers were quick to point out the figure bore a remarking resemblance to the figure that certain pro-Brexit campaigners suggested would be available for the NHS after the UK’s departure. The Irish have an expression, “even the dogs in the street know…”, meaning a statement of the bleedin’ obvious. Well, when it comes to the potential disaster that is the likely imposition of a hard border within the island of Ireland, the dogs in the streets of both parts of Ireland, know who to blame: the arrogant, careless Tory government and the lying Brexiteers who don’t give a toss about the Irish people, North or South. If Theresa May had not given in to the Brexit-fanatics and, instead, made it clear that Britain would remain in the single market and/or customs union (a mix of the Norway and Turkish options), the Irish border problem and the threat to the peace process would not have arisen. But this has been ruled out by the UK government. 1/ A border down the Irish Sea, giving the North special status with the single market and customs union. This is anathema to the DUP and unacceptable to the British government as it would be seen as dividing the UK . 2/ The Hammond plan for the UK to remain within the single market and the customs union for a two year (or longer) transitional period. But this is unacceptable to the Brexit-fanatics within the cabinet and the Tory party, although the Irish government strongly favours it. These realities, and British (well, English) culpability for jeopardising the peace process, have been spelt out time and again, for instance by the respected Irish commentator Fintan O’Toole (here and here). 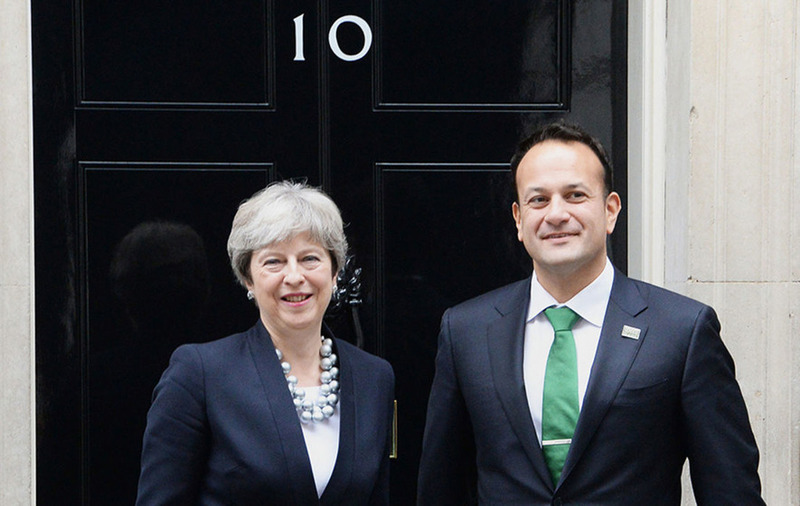 IRISH Taoiseach Leo Varadkar and Foreign Minister Simon Coveney insist they will obstruct the next phase of London-Brussels negotiations without a British government assurance. His stance is shared by Sinn Fein, whose leading MEP Martina Anderson held recent meetings with EU negotiator Michel Barnier and European Parliament co-ordinator Guy Verhofstadt. 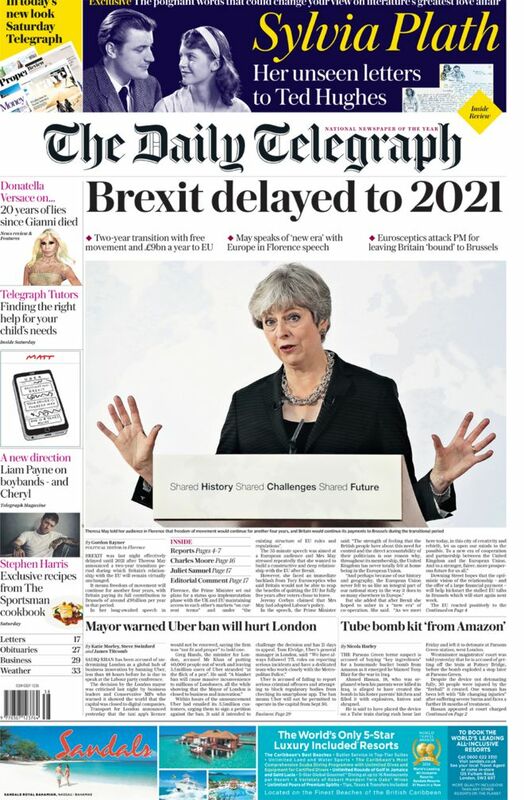 She told them that the Leave agenda pursued by the May government is incompatible with the Good Friday Agreement, especially in view of the Tories’ dodgy deal with the DUP. But where is the evidence that the British government or any significant player in either Britain or Ireland wants to change current Irish border arrangements? What the Fine Gael-led Dublin government and Sinn Fein omit to mention is that the demand for a hard EU border comes from the EU Commission itself. Brussels wants to site that border not on the already existing demarcation between Northern Ireland and the Irish Republic but between Northern Ireland and Britain. It insists on a special arrangement for the six counties to place it inside the EU single market and customs union, effectively extending the EU in defiance of the UK leave vote. Britain’s refusal to accept this formula is portrayed as a dangerous provocation that could scupper the Good Friday Agreement and reignite sectarian hostilities. It is understandable that Sinn Fein, a party with Irish reunification at its heart, should adopt an EU ploy to effectively detach the six counties from the UK, but Fine Gael has a diametrically opposed historical record. While equally committed to the goal of a united Ireland, as is the Morning Star, the CPI monthly journal Socialist Voice reminds readers that the core tenets of socialism and republicanism are independence, sovereignty and democracy. It points out that Ireland “cannot be a sovereign country under any imperialist apparatus,” whether dominated by Britain, the EU or the US. The clear thinking of Irish communists, shared by their comrades in Britain, is in stark contrast to that of others on the left in both countries who see in the EU, through rose-tinted spectacles, an international co-operative body based on solidarity and respect for workers’ rights rather than a bloc devoted to the interests of transnational capital. There is no truth in the EU assertion that having different tax systems in the two parts of Ireland makes a hard border inevitable. The republic and the six counties already have different levels of corporation tax and VAT, but this has not prevented smooth cross-border trade. Those flagging up future difficulties, which, given goodwill, are quite easily surmountable, do so to bolster different political ambitions. UK voters have made their choice and will not favour efforts to thwart it just as the people of Ireland on either side of the currently hassle-free dividing line will not welcome duplicitous attempts to reintroduce a hard border. “’A country that works for everyone’ becomes ‘A country that works…or everyone’, as letters begin to fall off the slogan. Does the Telegraph think Europe’s security should be a “bargaining chip”? “In security terms a failure to reach agreement would mean our cooperation in the fight against crime and terrorism would be weakened,” she wrote in the letter to European Council President Donald Tusk. 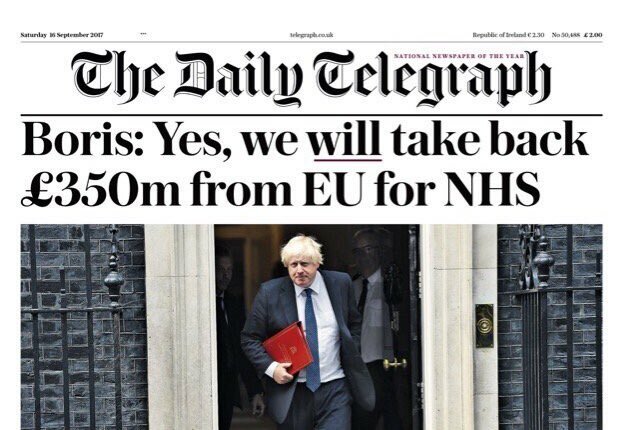 Wisely, May did not repeat this outrageous threat in her Florence speech yesterday. But, according to the increasingly shrill and fanatical pro-Bexit Torygraph, there are people who thing she should have. Now, just re-read that passage. Yes! It says what you thought it said. My only question is, do the people making these “accusations” include the likes of Torygraph ex-editor and veteran anti-EU fanatic Charles Moore, current editor Chris Evans (no, not the DJ) and the rest of the Torygraph top brass?